A new four-story building is planned to replace two buildings in the 1100 block of Main Avenue. The mixed-use building could house 42 apartments. A new four-story building is planned to replace two buildings in the 1100 block of Main Avenue and one along Narrow Gauge Avenue. Stone from the JITA Contracting building along Narrow Gauge would be reused on the west- and south-facing walls. A mixed-use building that could house 42 new condominiums and commercial space could be built next spring in the 1100 block of Main Avenue. The four-story building would take the place of three existing buildings: one that houses X-Rock (105.3 FM), one that used to house Fast Signs, both on Main Avenue; and a third that houses JITA Contracting on Narrow Gauge Avenue. The 70,935-square-foot building would have retail and commercial space on the first floor and condos on all four floors. The Durango Planning Commission unanimously approved the project earlier this week during the final public vote on the project. “This seems completely brilliant, and I feel like everyone involved has really worked hard to make everything work,” said Planning Commissioner Jason Cross. He lauded the project for bringing more housing downtown and the economic boost the new residents could add to the area. Along Main Avenue on the first floor, the building could accommodate a restaurant, retail and/or commercial space, depending on demand, developer Joel Aguilar, owner of JITA Contracting, said in an interview. The first floor would also house office space and five one-bedroom condos. The upper floors would house studios and one- and two-bedroom units. The housing units would be market rate, but they would likely offer a more affordable option compared with other homes downtown because of their small size. Most of the units are between 500 and 1,200 square feet. It is a housing model that is expected to draw a more diverse population. “We are excited about it, because of that mixed-user element,” architect Lauren Jackson told the Planning Commission. The building would provide storage space for new residents to supplement the minimal square footage in the condos. The building would also have 60 parking spaces for residents and visitors in a garage beneath the building. The top two floors of the building would be stepped back from the outer wall along Main Avenue to help hide the building’s height from pedestrians. The west and south walls of the building would feature stone from the JITA Contracting building, a former mechanics shop, which is planned to be demolished. “People want to see something unique downtown that still tells the story and has a sense of place,” Jackson said of the stone. The stone is also planned to be used in the building’s floor and in the rooftop patios, she said. Building construction is expected to last about 18 to 24 months, and once complete, the condos are likely to become rentals. Over time, the rental units could be sold, Aguilar said. However, the market will drive whether the units are sold or rented, he said. The project has some financing, but the developers are open to additional investment, he said. 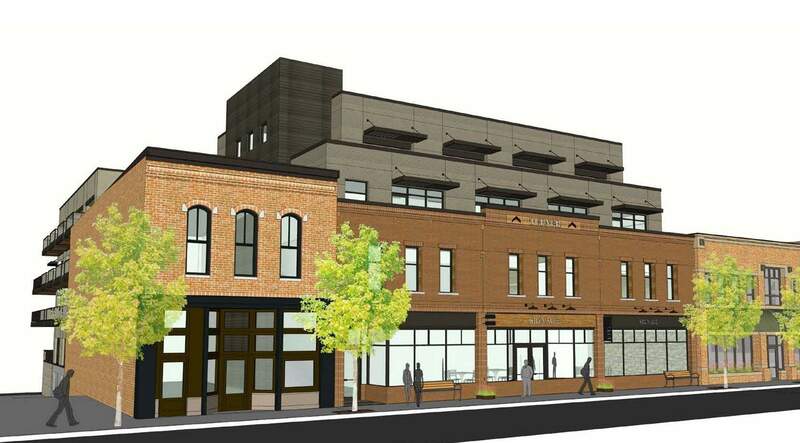 Do you support the development of four-story residential/commercial buildings in downtown Durango?